Wholesale Sterling Silver Shoes, boots and Fashion Pendants. We have Sterling Silver Baby Shoes Pendants, Women Fashion Shoe Pendants, Sterlng Silver Western Boots Pendants, Fashion Hats Pendants, High Heel Shoe Pendants, Pocketbook and Purse Pendants and saddle pendants. 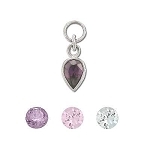 In addition to sterling silver Shoes, Boots and Fashion Stone Pendants, visit our other Sterling Silver Pendants.